Suspect sought in ATM Robberies | Crime Stoppers of the Lowcountry: 554-1111 | 1-888-CRIME-SC | Anonymous tips earn cash rewards with Crime Stoppers of the Lowcountry. CHARLESTON, SC - City of Charleston Police are searching for an armed robber they believe is responsible for two robberies at a Johns Island ATM. The first incident occurred at 11:40 p.m. Wednesday at the Bank of America ATM at 1822 Bohicket Road. The victim had just withdrawn $400 when a black male took it from her. When a passenger in the victim's car got out to confront the suspect, he pulled out a sawed-off shotgun. The suspect then fled the scene on foot. On Thursday night around 10:30 p.m., another victim was robbed of $200 at the same location. This time the suspect was wearing a ski mask. After the victim had gotten her money, the suspect put a sawed-off shotgun to her head through the car window and stated, "Let me get that." The suspect then fled on foot into a wooded area nearby. According to police, the suspect is 5'8"-5'9" tall, and weighs around 150-160 pounds. The victim in the first robbery says the suspect is bald and clean shaven. 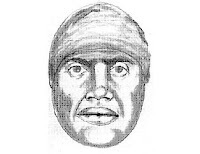 City of Charleston Police have released a composite sketch of the suspect, pictured above right.